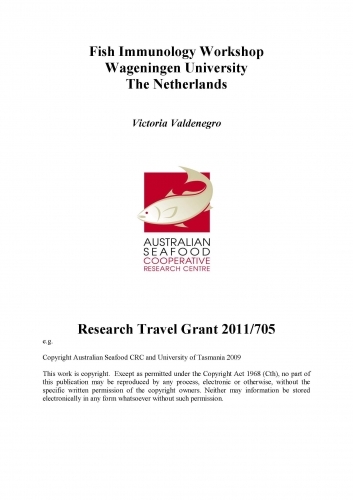 This research travel grant allowed a Seafood CRC PhD student, Victoria Valdenegro to participate in the Fish Immunology Workshop 2011, which was held from April 17th – 21st 2011 at Wageningen University in the Netherlands. This workshop was highly relevant to the PhD project, which involves study of the immune response of Atlantic Salmon as a means to design an experimental vaccine against Neoparamoeba perurans, the causative agent of amoebic gill disease (AGD). AGD is the main disease affecting the salmon industry in Tasmania, and the development a vaccine against the pathogen is remains a very high priority for its control. The workshop program included presentations by world renowned experts in fish immunology such as Chris Secombes from the University of Aberdeen and Jan Rombout from the CBI, University of Wageningen, who have worked in fish immunology for several years particularly in topics including vaccination and mucosal immunity, including parasitic diseases. However, the most important opportunity this workshop offered were two sessions (afternoons) of hands-on practicals in humoral responses and assays in innate immunity, which provided advanced knowledge on the immune system of fish. As part of the workshop, participants were also encouraged to share their work as a poster and distribute a short abstract about their research. This travel grant allowed the student to meet with staff and students from different laboratories in Europe (Scottish Fish Immunology Research Centre, Aberdeen; National Veterinary Institute, Denmark; Cell biology and Immunology group, The Netherlands; Laboratory of Aquatic Pathobiology, Univ. of Copenhagen, Denmark; etc), and talk about research and possible future collaborations. Furthermore, training was completed in specific and advanced immunological techniques which are directly applicable to her PhD research project.